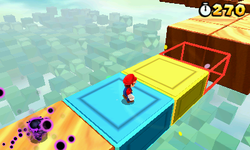 Special 7 is the seventh special world appearing in Super Mario 3D Land. 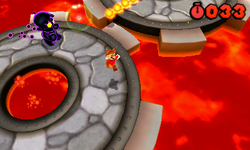 The area in the background is pink in color and contains several trees of varying sizes, as well as several scattered plateaus and many flowers near the map itself. There are six levels and a Mystery Box. 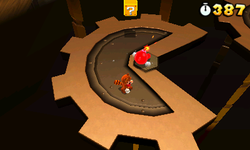 Special 7-1 A harder version of World 3-4 with the time set to 30 seconds. 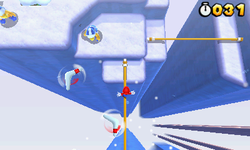 Defeating Boomerang Bros. awards the player with an additional 10 seconds. 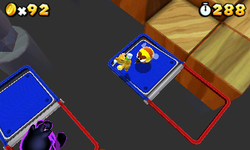 Special 7-2 A second variant of World 6-4, with the Beat Blocks reverting back to what they were in 6-4, but the Cosmic Clones make an appearance. Special 7-3 A harder version of World 7-4. Special 7-4 A harder version of World 2-4 with a massive Cosmic Clone that will destroy any Brick Blocks it touches. 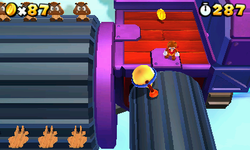 Special 7-5 A harder version of World 7- Airship with faster spinning cylinders and a multitude of Flophoppers. Special 7- A harder version of Special 1- (in and of itself a harder version of World 1- ) with the player being chased by a massive Cosmic Clone. Requires 220 Star Medals to be unlocked. This page was last edited on December 1, 2018, at 20:52.